Sally Ann Schoenfeld of Christine, passed away December 6, 2017 at the age of 81. She was born in Auburn, Nebraska to Jessie Melvin and Ida Mae (Mason) Kyriss on December 31, 1936. Sally loved fishing, hunting and reading, but above all she loved being with her family. She will be greatly missed by all who knew and loved her. 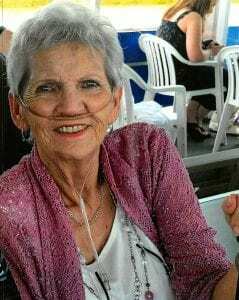 Sally is survived by her two grandchildren, Russell and Kevin Schoenfeld; great grandchildren, Sharon, Dana, Cathrine, Desirae, Whitney, Max and Rustin; former daughter-in-law, Doris Smith and her best friend, Glenda DeShane. Sally is preceded in death by her husband, Franklin Russell Schoenfeld; sons, Larry Lee Lindsey, Dennis Ray Lindsey and Steven Alan Kawwedsky; daughter, Sharon Ann Lindsey; parents, Jessie and Ida Mae Kyriss and sister, Geraldine Mae McAlexander. There are no services scheduled at this time. Please visit hurleyfuneralhome.com or call 830-569-2535 for updates. For anyone wishing to leave condolences for the family, share memories or sign the online guestbook may do so at www.hurleyfuneralhome.com.